It was with some luck that I managed to squeeze in some time last week to bake a batch of muffins. I adapted the recipe for the raisins & chocolate chips muffins and turned it into these Cranberry Orange & Chocolate chips muffins. A great way to use up those little packs of dried cranberries or craisins that I have bought several weeks ago. The muffins were baked almost to a perfection...what I mean is, that my oven took the same recommended time to get the muffins all beautifully browned. With the help of a oven thermometer, I had let the oven preheated slightly above the required temperature...so by the time the muffins were in the oven, the temperature dropped to the desired level at 180degC. I liked the way the muffins were all cracked nicely on top...and they tasted fabulous...very fluffy and moist...despite the fact that there's no yoghurt or buttermilk used in this recipe. The craisins and orange combo went every well together too. The only thing that I can find fault with these muffins is that they were a little on the sweet side for me...all due to the white chocolate chips that I have used! Next time I will either cut down on the sugar, or used dark chocolate chips instead. Pre-heat oven to 180degC (350 degF). Melt butter in a saucepan, over low heat, set aside to cool. Sieve together flour, baking powder, baking soda and salt into a mixing bowl. Add chocolate chips, craisins, orange zest and mix with a spatula. Make a well in the centre. Place egg, melted butter, milk, orange juice and sugar in another bowl. Mix (with a manual whisk) until thoroughly combined. (To cut down on washing up, I mixed these ingredients into the saucepan which I used to melt the butter). Pour the liquid mixture into the flour. With the spatula, gently fold all the ingredients to form a wet batter. Just mix until the flour are incorporate into the batter. DO NOT Over mix. The batter will appear lumpy. Spoon batter into paper muffin cups. Bake for 15~20mins until muffins turn golden brown or a toothpick inserted into the centre comes out clean. Hi, would like to know where did you get the oven thermometer? Hi Aimei, thanks! Xin Nian Kuai Le! Hi Anonymous, I got my oven thermometer from Phoon Huat. Those muffins sound really good. Hi Your muffins looked so good I made a batch last night, but I think I over mixed (even though you put in CAPS not to!) so see lah, don't follow instructions and they came out a little like rock cakes. But still yum! The muffins look gorgeous! I just realised that a few of your recent recipes, including this one, are from the same book as I have! Unlike you though, I have not experimented a great deal with the recipes so far unfortunately, because my oven's bad heating properties prevent it from being able to properly cook through loaves of bread. Having said that, the Swedish Dill Bread worked for me, and I highly recommend it. It tastes absolutely fantastic, because of it's yummy flavour and mouth-watering aroma. Back to the muffins; I've never tried making any baked goods with orange, coz the thought of cooked oranges does not appeal to me - does it make the product taste really orangey (or is this obvious?) and does the juice from the fruit seep into the batter to make the cake all soggy (coz I find that ripe peaches do that)? Eliza, thanks, and happy lunar new year! 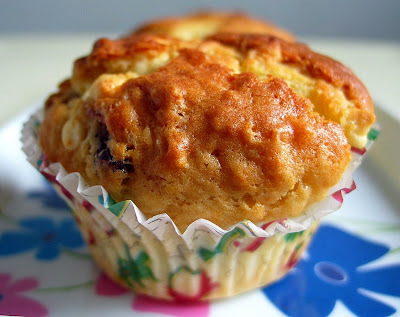 your muffins looks sooo yummilicious! will try it later. btw, would you have any recipes for green tea muffins? i especially like those from breadtalk. 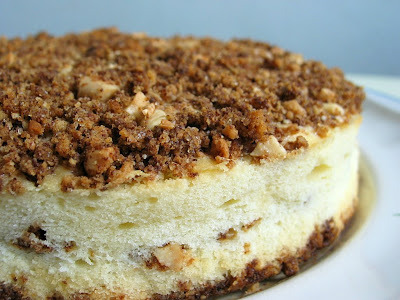 Hi, recently came across your blog while looking up recipes for cakes, cupcakes and cookies. 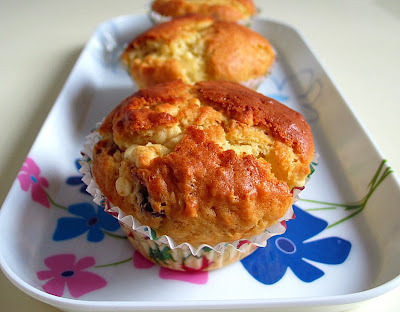 The cupcake cups which is like the paper muffin cups in your Cranberry, Orange & Chocolate Chips Muffins recipe, can be used in the oven as mentioned? My hubby is concerned that it might burn into flames when put into the oven to bake? Can advise? I am afraid I am not sure about using these paper liners in your oven as these paper liners I bought do not state whether they are safe for use in microwave ovens...however, if u get paper liners from Daiso, most of the time it's stated in the packaging whether it is safe for use in the oven, and some also state the max. temperature. Do check with the staff there as the text are written in Japanese. Hope this helps. Thanks for the advice. Will drop by Daiso to check it out. I'd tried out your 'Pooh & Piglet cut out cookies recipe to a T. The only difference is the cookie cutters as I had got them some months back from Daiso intending to learn baking. However it is too big and I tried unsuccessfully to cut as the dough kept breaking. So I upped the thickness of the dough first before cutting. I managed to cut in the end.Also I added choc chips to the dough. The after taste was good. We both finished the cookies.